Our Atrium King room has all the features of our Foundation King, but with an interior atrium view. Enjoy a plush couch and seating area with a table, a work desk, custom-built dresser with closet, and a spacious bathroom. This room also comes with a fully stocked, locally curated private bar. Detroiters are making great stuff in our own backyard, so we put it in our rooms. 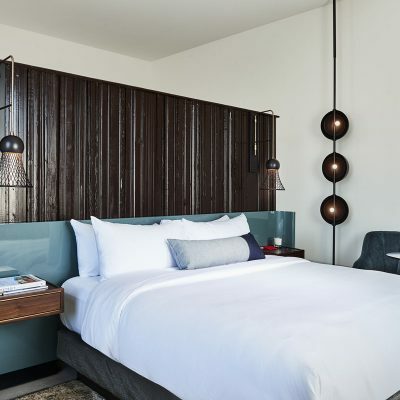 Inspired by the Motor City, our rooms feature touches from talented locals, such as iron-welded door handles from Smith Shop, in-room leather trays from Douglas & Co., wallpaper from the Detroit Wallpaper Co., hefty bottle openers from Woodward Throwbacks, and issues of TBD magazine, among others. Our in-room private bars are curated to address a variety of snacking and drinking needs, stocked with the finest, locally made offerings. Indulge in artisan chocolates from Bon Bon Bon, handmade whiskey from Journeyman Distillery, potato chips from McClure’s, snack mixes from Germack Pistachio Company, micro-distilled vodka from Our/Detroit, candy bars from Zingerman’s, sodas from Fever-Tree, and beers from Founders Brewing Co. It’s the right thing to be doing. Feeling fresh goes a long way. Fortunately, our guests can awaken with invigorating, hand-blended toiletries from Le Labo, including shampoo, conditioner, shower gel, and body lotion. Never tested on animals, Le Labo’s products magically capture new and intimately familiar smells inside each bottle. Allow us to provide a truly tailored experience—pun intended. Purchase of our 1701 Bespoke add-on includes a personal fitting with the 1701 tailors, transportation to and from your fitting appointment, a complimentary dress shirt with the purchase of a 1701 tailored suit, and a whiskey to enjoy before or after your appointment. Please contact DFH Reservations at 313-800-5555 with any questions about our add-on experiences. Looking for denim with effortless fit? Head to Detroit Denim for a custom denim experience. Purchase of our Detroit Denim add-on includes an exclusive leather bi-fold DFH wallet and a $250 gift card. The gift card covers the value of a pair of prefabricated jeans, to be hemmed to your preference upon purchase at the Detroit Denim store. Gift card value can also be used toward the purchase of fully custom-tailored jeans.